Passengers of a Southwest Airlines flight traveling from Dallas, Texas, to Memphis, Tennessee, were treated to some unusual in-flight entertainment Tuesday. 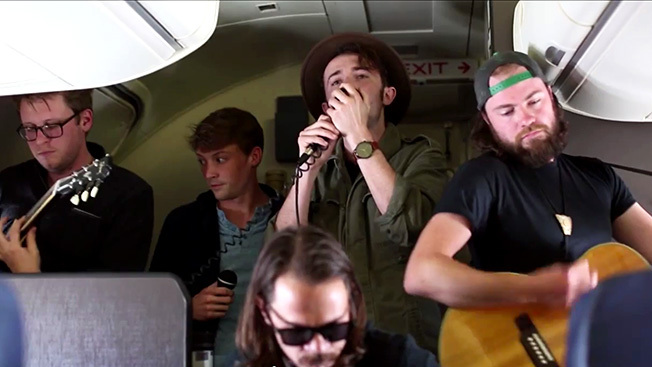 When the plane reached 35,000 feet, indie rock band The Black Cadillacs took the aisle for an in-flight concert. The Memphis band was on a mission to promote the city's vibrant music scene and, in turn, Tennessee tourism. Kansas City agency VML orchestrated the mile-high show by bringing together two of its clients: Tennessee Department of Tourist Development and Southwest Airlines, which just introduced nonstop flights to Memphis from Dallas. "Tennessee is a global music destination," said Kevin Triplett, tourism commissioner. "To have an additional flight that allows so many more visitors to come into our state, into a city like Memphis—for Southwest to add a connection here, that's huge for us. It's another avenue for visitors to taste another part of Tennessee." The concert, part of Southwest's ongoing "Live at 35" series, which has had bands like Imagine Dragons and The Dunwells perform in-flight, is part VML's latest campaign to promote Tennessee tourism. For the concert, the Black Cadillacs wrote a new song about their hometown, part of the new documentary produced by VML called "Last Song to Memphis." "How can you get a city to help you write a song?" said John Godsey, ecd at VML. "What other city would help you write a song but Memphis? Think about it, everything was born here. Rock n' roll, the blues, Southern soul—it was all born here. This is ground zero of American music."